The Armchair Explorers Reading Group will meet at the Around the Corner Cafe on Tuesday, July 22nd at 6:30pm to discuss In the Time of the Butterflies, by Julia Alvarez. Julia Alvarez "A Wedding in Haiti: The Story of a Friendship"
Julia Alvarez has been called “a one-woman cultural collision” by the Los Angeles Times Book Review, and that has never been truer than in this story about three of her most personal relationships—with her parents, with her husband, and with a young Haitian boy known as Piti. A teenager when Julia and her husband, Bill, first met him in 2001, Piti crossed the border into the Dominican Republic to find work. Julia, impressed by his courage, charmed by his smile, has over the years come to think of him as a son, even promising to be at his wedding someday. When Piti calls in 2009, Julia’s promise is tested. Bestselling novelist Alvarez reflects on the joys and burdens of love in A wedding in Haiti, a memoir that travels across borders. Her journey to Haiti for a friend's wedding, and a year later in the aftermath of the 2010 earthquake, opens Alvarez's eyes to the resilience of the human spirit. PLEASE NOTE: This event will take place in the gallery of the Hardwick Inn, just up the street at 4 South Main Street. The Galaxy welcomes author Julia Alvarez for a reading from her newest book, A wedding in Haiti. A memoir, A wedding in Haiti chronicles her journey to Haiti, first for the wedding of a friend, and then again after the devastating earthquake that shook Haiti in 2010. Ms. Alvarez will include photos and audio from her trip in her presentation. Alvarez is the author of How the Garcia Girls Lost Their Accents and In the Time of the Butterflies and a 2011 recipient of the Vermont Governor's Award for Excellence in the Arts. Currently a writer-in-residence at Middlebury College, she also spends time on the sustainable farm-literacy center, Alta Gracia, that she founded with her husband in the Dominican Republic. Julia Alvarez has been called "a one-woman cultural collision" by the "Los Angeles Times Book Review," and that has never been truer than in this story about three of her most personal relationships--with her parents, with her husband, and with a young Haitian boy known as Piti. A teenager when Julia and her husband, Bill, first met him in 2001, Piti crossed the border into the Dominican Republic to find work. Julia, impressed by his courage, charmed by his smile, has over the years come to think of him as a son, even promising to be at his wedding someday. When Piti calls in 2009, Julia's promise is tested. To Alvarez, much admired for her ability to lead readers deep inside her native Dominican culture, "Haiti is like a sister I've never gotten to know." And so we follow her across the border into what was once the richest of all the French colonies and now teeters on the edge of the abyss--first for the celebration of a wedding and a year later to find Piti's loved ones in the devastation of the earthquake. In A wedding in Haiti (Algonquin, $22.95), as in all of Alvarez's books, a strong message is packed inside an intimate, beguiling story, this time about the nature of poverty and of wealth, of human love and of human frailty, of history and of the way we live now. Julia Alvarez, "A Wedding in Haiti"
Join us for a luncheon with Julia Alvarez at the Union League Cafe! The honesty of this book is refreshing. Ms. Alvarez takes us on her journey of friendship and family and gives a rare look inside her life. Funny, candid, and beautifully written. A reminder for anyone of what it means to be human and compassionate. To Alvarez, much admired for her ability to lead readers deep inside her native Dominican culture, “Haiti is like a sister I’ve never gotten to know.” And so we follow her across the border into what was once the richest of all the French colonies and now teeters on the edge of the abyss—first for the celebration of a wedding and a year later to find Piti’s loved ones in the devastation of the earthquake. As in all of Alvarez’s books, a strong message is packed inside an intimate, beguiling story, this time about the nature of poverty and of wealth, of human love and of human frailty, of history and of the way we live now. When Julia and her husband Bill first met Piti in 2001, he was a teenaged Haitian boy who had illegally crossed the border into the Dominican Republic to find work. Julia, impressed by his courage, came to think of him as a son and promised to be at his wedding someday. In 2009, we follow her across the border into what was once the richest of all the French colonies, first for the celebration of a wedding and, another year later, to find Piti's loved ones in the devastation of the earthquake. As in all of Alvarez's books, a strong message is packed inside an intimate, beguiling story, this time about the nature of poverty and of wealth, of human love and of human frailty, of history and of the way we live now. American fiction write and professor of English Helena Maria Viramontes will be joining Julia in a conversation about Julia’s latest book. The discussion is free and open to the public. It takes place at All Saints Church, 132 N. Euclid Ave., Pasadena, CA 91101 in the Forum (downstairs in the building facing Euclid). Please keep our general signing guidelines in mind for this event: Those wishing to get books signed will be asked to purchase at least one copy of A wedding in Haiti from Vroman's for every 3 books they bring from home. Save your Vroman's receipt, as that will serve as your ticket for the signing line. Julia Alvarez , Return to Sender. From 2009 National Book Festival brochure: "Although Julia Alvarez was born in New York City, her family moved to the Dominican Republic shortly after birth, where she spent the majority of her childhood. In 1960, when she was 10, her family returned to the United States, fleeing the Dominican Republic because of her father's involvement in an unsuccessful attempt to overthrow the dictator Rafael Trujillo. Alvarez calls herself an American, yet her writing bridges the realms of Latina and American culture." 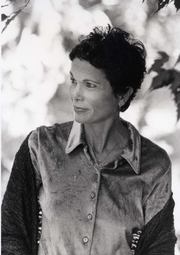 Julia Alvarez is currently considered a "single author." If one or more works are by a distinct, homonymous authors, go ahead and split the author. Julia Alvarez is composed of 5 names. You can examine and separate out names.